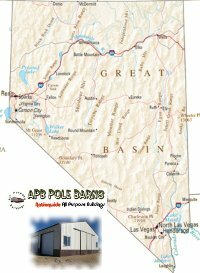 We provide Nevada pole barn plans for general storage as well as farm and ranch applications. These plans are not engineer stamped. They include a material list by building section as well as a summary material list. Your building can be a simple un-insulated storage barn or include insulation, a hay loft or attic trusses for storage. Need a farm building, garage, or extra storage? A pole building from APB Pole Barns is the most cost effective long lasting solution to your problem. We design inexpensive pole barns and sell custom pole barn kits too. If you are a DIY builder we can provide the materials and structural building plans for your building. Stamped engineered plans are available for any type of structure from garages to farm buildings to commercial structures. Have Questions? Contact us at (210) 650-2276 or get pole barn prices for your project using our online form. We are here to help.